Middle Davids Artisan Candles – Candles for your life. light of a single candle. Welcome to Middle Davids Candles! We are a family owned and operated small business in Franklin, Indiana, known for the handcrafted soy candles we make right here in our store and the artists’ work that we showcase. Founded in 2002, we have continued to develop and practice a philosophy of product quality, eco-friendly practices, community involvement and partnership with fellow artists. Our approach to green practices is twofold: first, eco-friendly products, and second, eco-friendly production methods. Instead of the commonly used paraffin wax — a fossil fuel — our candles are hand poured with locally farmed soy wax, providing a clean, organic burn. Middle Davids candles are strongly fragranced with concentrated oils to ensure optimum fragrance when the candle is both hot and cold and fragrance that continues until the last burn. Plus, we use vibrant colors that enhance our candles’ natural beauty. Our production facility operates with almost zero waste, and we offer in-store credit to customers for returning used candle jars so we can reuse them. 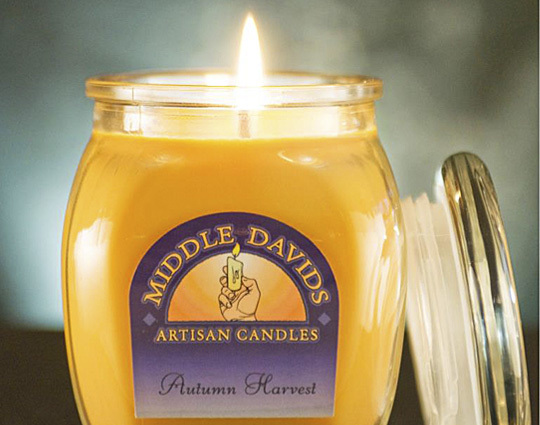 Middle Davids candles burn long and clean, and we guarantee total satisfaction or a free exchange. 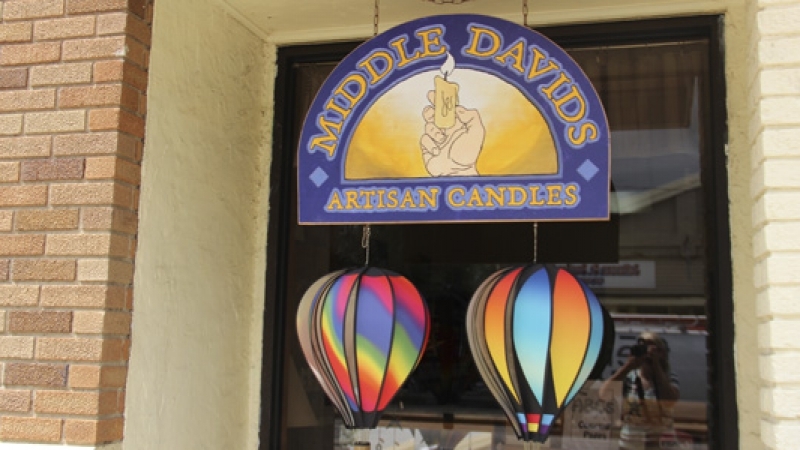 Thinking about selling Middle Davids candles in your store? We have options to get you started. Our candles make great gifts. We offer custom labels, fragrances and dyes — you can even help make them! Let us handle this part of your big event for you! Design gifts with custom labels, fragrances and more. What do bicycles have to do with a candle shop?